Higher education families will now have more time to wade through their financial aid options thanks to changes in the submission process for the Free Application for Federal Student Aid. The FAFSA is used to determine student financial aid eligibility and is completed every year a student attends college. It can be submitted earlier. Students can file their FAFSA as early as Saturday, Oct. 1, rather than beginning in January 2017. The earlier submission date will be a permanent change. It will use earlier income information. Students will now be required to report income and tax data from the tax year two years prior to the academic year. For the 2017-18 FAFSA, students and their parents will report their 2015 information instead of their 2016 records. Less guesswork. By using an earlier tax year, families can now complete the FAFSA without estimating their tax information. “It will probably save families paperwork, because they can use completed taxes,” Danielson says. Easier to report tax information. Because families will have already completed their taxes needed for the FAFSA, they might be able to take advantage of the IRS Data Retrieval Tool. It allows families to automatically import tax information into their FAFSA. “A lot of families could not take advantage of this in the past,” Danielson says. Less stress during senior year. Because they will know their financial options earlier, some students might choose their college sooner. “Knowing what college they’re going to attend will maybe make the senior year a little less stressful,” Danielson says. Seniors should aim to decide before May 1, because they can still be reimbursed a portion, if not all, of housing or tuition deposits they made to colleges they no longer plan to attend. Because FAFSA season is starting sooner, some colleges have moved up their FAFSA priority date. Students should complete their FAFSA by this deadline to be considered for the most money. 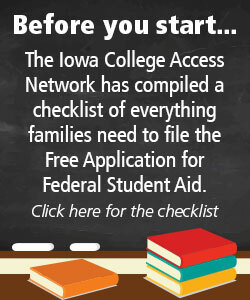 ICAN has compiled the FAFSA priority dates for Iowa colleges and universities.